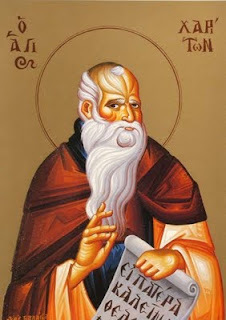 The Monk Chariton the Confessor suffered at Iconium during the time of one of the persecutions against Christians under either the emperor Galerius (305-311), Maximian (305-311) or Licinius (311-324). The grace-bearing example of the holy First-Martyress Thekla (Comm. 24 September) encouraged him in his confessor's deed -- she being a native of his city, whose memory he in particular deeply venerated. Saint Chariton bravely denounced the pagan gods and staunchly confessed faith in the One True God -- Christ the Saviour. The holy Confessor underwent fierce tortures but, through the Providence of God, he remained alive. When the persecution abated, the saint was set free from imprisonment and he dedicated all his life to the service of the Lord. Journeying to Jerusalem on pilgrimage to the holy places, he fell into the hands of robbers. They tied him and threw him in a cave, intending later to kill him, and they themselves hastened off on business. In expectation of death the saint prayed heatedly, he gave thanks to God and entreated him to do with him according to His will. At this time a snake crawled into the cave and began to drink wine from a vessel setting there, poisoning it with its deadly venom. Having returned to the cave, the robbers drank the poisoned wine and they all perished. The Monk Chariton, giving thanks to God, began asceticising at the place of his miraculous rescue. The plundered gold of the robbers he distributed to the poor, and in the monastery -- in the robbers cave he built a church, around which in time there formed a monastery -- the reknown Tharan Laura in Palestine. The Monk Chariton compiled a strict ustav (rule) for his monastery. Yearning for solitude, the monk went farther into the wilderness, but there also he did not reject those who besought his spiritual guidance , and he founded yet two more monasteries -- the Jerichon and the Tree-branched, named the "Palm Laura". At the end of his life the Monk Chariton asceticised in a cave on an hill, nearby the Tree-branched monastery, but he did not cease guidance with all three of the monasteries founded by him. By tradition, the Monk Chariton compiled the office of taking monastic vows. The Monk Chariton the Confessor died in extreme old age and was buried, in accord with his last-wishes, in the Tharan monastery in the church, built on the spot of the robbers cave.